With exterior styling that's guaranteed to catch the eye, the Citroen C3 Picasso is not a car to be overlooked. The sweeping curves at the front contrast with the model's square rear, while playful styling gives it plenty of character and a keen sense of fun. Inside you'll find a practical and stylish space that's a pleasure to spend time in. 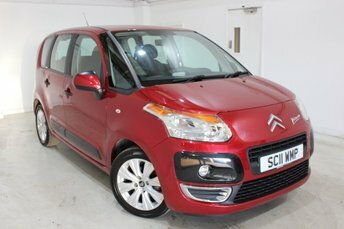 You can take a closer look at the used Citroen C3 Picasso models for sale in Dukinfield here on our website, but don't forget to pay a visit to the showroom and test drive the vehicle of your choice. Feel free to contact a member of the team at AWB Motor Co Ltd if you require further information or would like to discuss your specific requirements. Finance is available to UK residents aged 18 years or older, subject to status. Terms & Conditions apply. Indemnities may be required. Other finance offers may be available but cannot be used in conjunction with this offer. We work with a number of carefully selected credit providers who may be able to offer you finance for your purchase, commission may be received. We are only able to offer finance products from these providers. Postal Address: AWB Motor Co Ltd, 193 King Street, Dukinfield, Cheshire SK16 4LG. Find contact details here. AWB Motor Co Ltd is authorised and regulated by the Financial Conduct Authority, FRN: 659928. All finance is subject to status and income. Written Quotation on request. We act as a credit broker not a lender. We work with a number of carefully selected credit providers who may be able to offer you finance for your purchase. We are only able to offer finance products from these providers.